Can I still buy a home with rising interes t rates? You’ve taken all the necessary steps to get ready to buy a home. You’ve saved for a down payment, improved your credit score, got all your financial documentation in line, and figured out what price range you can afford. And then the interest rates went up. Is your dream of homeownership now unachievable? According to recent data from realtor.com®, the share of first-time buyers planning to buy a home this spring fell sharply when mortgage rates began to rise toward the end of 2016. According to realtor.com®’s January survey of active homebuyers, 44 percent of buyers planning to buy in spring 2017 are first-time buyers. This has dropped significantly since the survey was conducted in October, when 55 percent of buyers planning a spring purchase indicated they were looking for their first home. However, with inventory shortages and rising home prices, the urgency to buy now has never been greater. So before you shelve your plans for buying a home this spring, know the facts about rising rates and home prices. The average 30-year conforming rate rose to more than 4.2 percent by the end of December 2016 from 3.4 percent at the end of September 2016. With average rates today about half a percentage point higher than they were in 2016, a median-priced home financed with 20 percent down would cost an additional $720 per year in added interest. That equals more than 1 percent of the median household’s income. With affordability being a top concern for first-time buyers, a rising interest rate can be enough to scare you off. 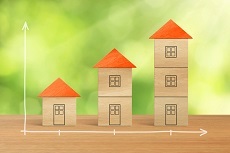 Kiplinger’s expects the 30-year mortgage rate to reach 4.6 percent by year’s end, with the 15-year rate at 3.8 percent. Add to that the continued increase in home prices due to low inventories in many parts of the country and you can see that holding off on a home purchase will probably only cost you more down the line. Take a cue from repeat homebuyers who are actually being spurred into action by rising rates. Even with the current increases, interest rates remain historically low, and the movement in rates hasn’t yet tipped overall buyer demand down. Experienced buyers, in fact, are trying to close before rates increase further, as evidenced by increased realtor.com® listing views and decreased inventory. In the short term, the rate movement seems to have encouraged, rather than dampened, overall demand. While concerns about affordability are valid, waiting may not help your long-term financial picture. Instead, consider looking for a home in a slightly lower price range, finding a way to increase your down payment, or looking in a neighborhood that may be more affordable. The good news? In today’s competitive market, your home will most likely increase in value and prove to be one of the smartest investments you could’ve made. Downsizing or First Home if it’s Small, These Tips are for You. When is a good time to sell your home? Don’t miss this beautiful Mukilteo home. 5 Factors for Newlyweds When Buying Your New Home. JudyGratton is "Your Real Estate Edge!"